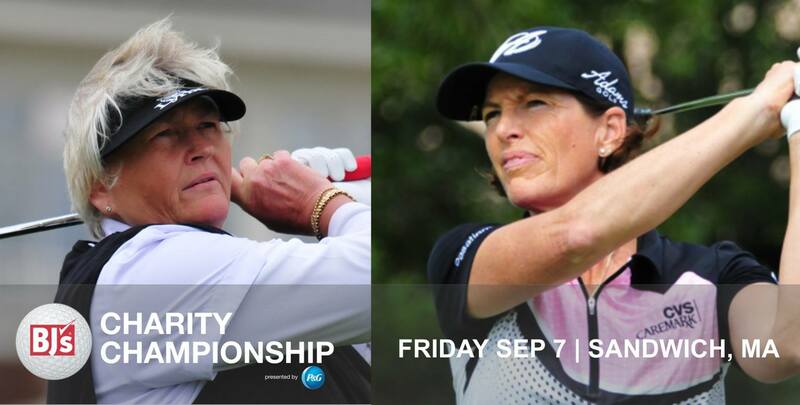 Laura Davies (left) and Julie Inkster and top legends of the LPGA Tour will compete in the second annual BJ’s Charity Championship, a 24-player team event scheduled Friday, Sept. 7, at The Ridge Club in Sandwich, Mass. Admission is free. SANDWICH, Mass. – Top legends of the LPGA Tour have once again committed to compete in this year’s second annual BJ’s Charity Championship. The 24-player team event will be held Friday, Sept. 7, at The Ridge Club in Sandwich, Mass. Two new player pairings in this year’s event will feature the team of Californians Juli Inkster and Pat Hurst, and Dame Laura Davies and Trish Johnson of Great Britain, who will make their first appearance together since pairing for The Legends Tour’s 2015 Handa Cup. Johnson recently won the Suquamish Clearwater Legends Cup in Seattle. Two popular LPGA Hall of Fame members, Nancy Lopez and Betsy King, will return to Massachusetts, pairing together for the 2018 event. Runners-up in the 2017 championship, Pat Bradley of West Hyannisport, Mass., and Barb Mucha of Orlando, Fla., hope to avenge their sudden-death playoff loss to Minnesota’s Michele Redman and Patti Rizzo of Florida. The two teams tied at nine under last year to force the playoff. Jane Blalock of Cambridge, Mass., will again pair with Californian Allison Finney. Blalock scored a hole-in-one on the par-3 seventh hole last year to win a Toyota. Bobby Orr, owner of The Ridge Club, will host The Legends Tour Friday Sept 7 which showcases the talents of LPGA Tour professionals age 45 and over representing some of the most talented female golfers in the history of the game. The 12 teams of two Legends Tour members will compete in an 18-hole format that features a best-ball first nine holes, followed by a second-nine-hole scramble. Falmouth Toyota will again sponsor a prize automobile for the first pro scoring a hole-in-one during competition. And kicking off the competition as the 2018 honorary starter will be Boston Bruin great Bobby Orr. •	Roping is limited – follow your favorites up close! •	Bring your own chairs – best kept secret spot: head to #16 tee and you can watch that tee plus shots into #12 green and #15 green. Great place to catch any action: first tee, 9 green, 10th tee and 18 green – all close to the clubhouse! Best par 3 to watch – #11 (you can also see shots into #10 green from there).